T.B. Clark & Co. of Honesdale, PA cut this very fine and very old ice tub and plate some time after 1886. Pearson (Vol.III, pg. 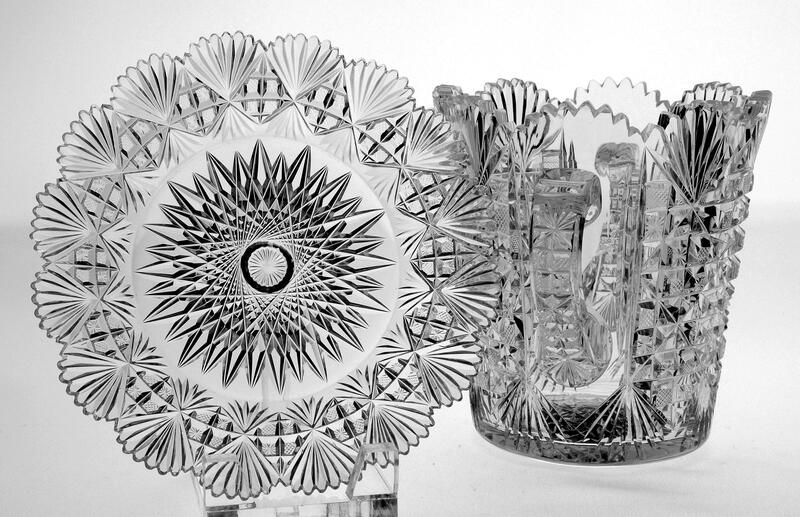 180) says, “The “Strawberry Diamond and Star” pattern, patented June 1, 1886, #16720 was designed by Walter A. Wood of Honesdale, PA and assigned to T.B. Clark & Co.” Pearson rated the design 4 for rarity (rare) and 2 for quality/price range (one of the most desirable). 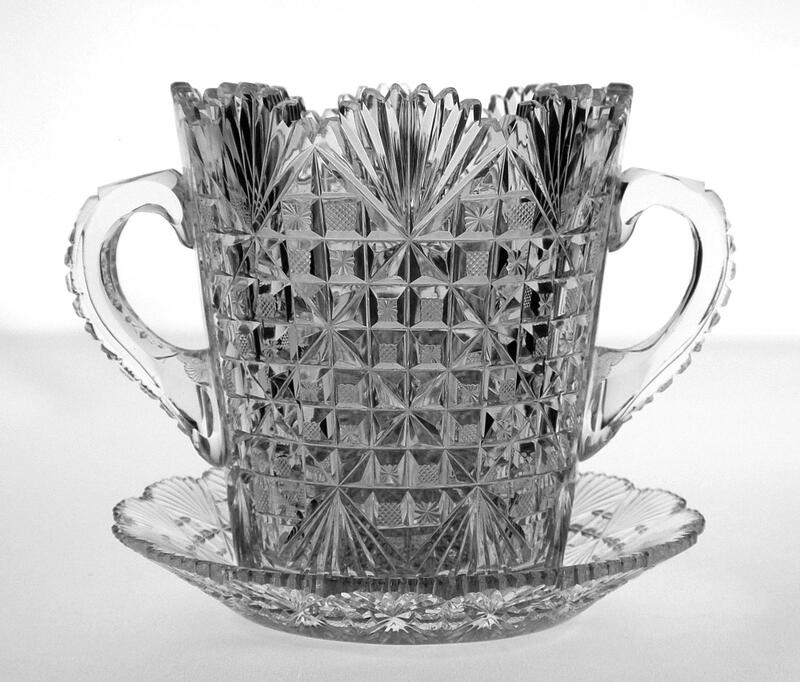 We favor ‘old glass’ of this sort because of 1) the clear, colorless blank, 2) the precise cutting of the design, 3) the wood-wheel finish with its soft, silky feel (as opposed to the later acid-finishing), 4) the pattern-cut handle, 5) the miters forming the upper fans that are cut through the bottom of the teeth and 6) details like the varied-length tips on the 32-point hobstar on the plate. The ice tub stands 6-inches tall and has a top diameter of 5 1/2-inches; it measures 8-inches handle-to-handle. The plate is 7 1/4-inches in diameter and just over 1-inch tall. Both pieces are in better than extremely fine condition. 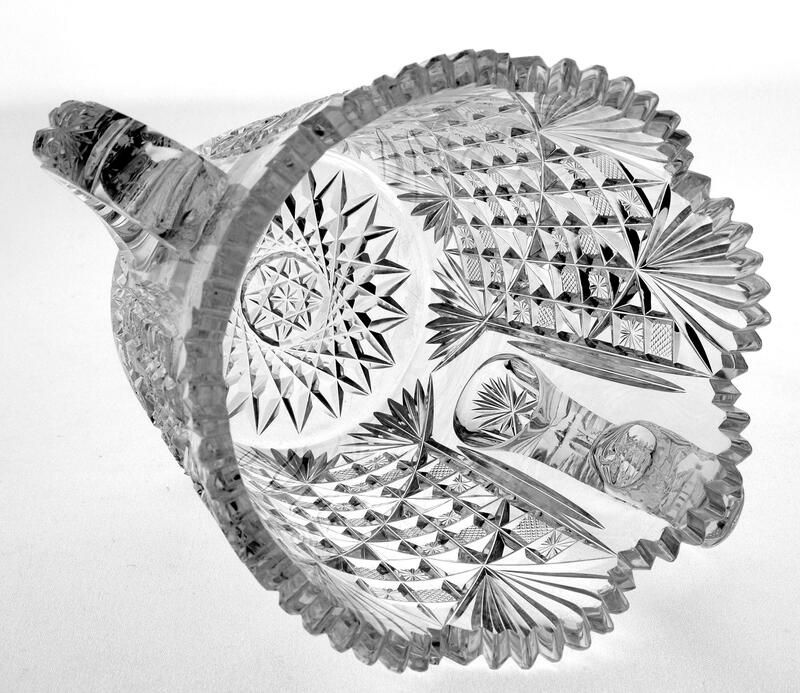 A beautiful and well-crafted piece that typifies ‘old glass’ at its very best. Ice tubs with matching underplates are very difficult to acquire.